All transactions are safe and secure with a reliable history in online purchasing behind each of our associates. 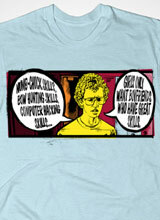 Buy the Napoleon Skills t-shirt to own Napoleon Dynamite clothing and merchandise. The design on the front of this black Napoleon Dynamite t-shirt lets everybody know that you've got great skills, including nunchuck skills, cagefighting skills, bowstaff skills and computer hacking skills. In the middle of the chest is Napoleon listing off the great skills that girlfriends want in a boyfriend. Use the funny Napoleon Dynamite quote that inspired this tee the next time your friends ask for dating advice. Tell them, "Girls like guys with great skills." This tee is the perfect gift to give with the Vote for Pedro t-shirt, which will guarantee that Pedro offers you protection. In addition to the Napoleon Skills tee above, browse the Napoleon Dynamite Clothing Gallery for more apparel like men's and women's clothes, kids shirts or hoodies.